outlived.bluebones.net – The site that tells you whom you have outlived. Almost every answer on Stack Overflow for this is terrible on moderately complex or large real data – https://stackoverflow.com/questions/4329396/mysql-select-10-random-rows-from-600k-rows-fast. This means executing your query for the entire resultset and then ordering it and then chopping off the number you need. This can have truly dire performance. Don’t pick random numbers from 1 to MAX(id) – deleted rows will be null or result in you getting less rows than you want. Who says your id is even sequential/numeric? Then pick N at random (removing those already chosen if you don’t want duplicates) from the resultset in your chosen programming language. If you just want one row from the db you can do this in SQL only as shown here: https://stackoverflow.com/a/31066058/375262. Doing N unique rows this way is left as an exercise for the reader. If you have a gargantuan resultset even SELECT COUNT(*) might be slow. What would you do then? Backticks around the reserved word. I found this working with JOOQ’s implementation of the SQL IN predicate. You can’t write myJavaLibObject.in(…) in Kotlin. You’ll get “Element expected” because in is a reserved word in Kotlin. Instead you need backticks: myJavaLibObject.`in`(…) will do the trick. 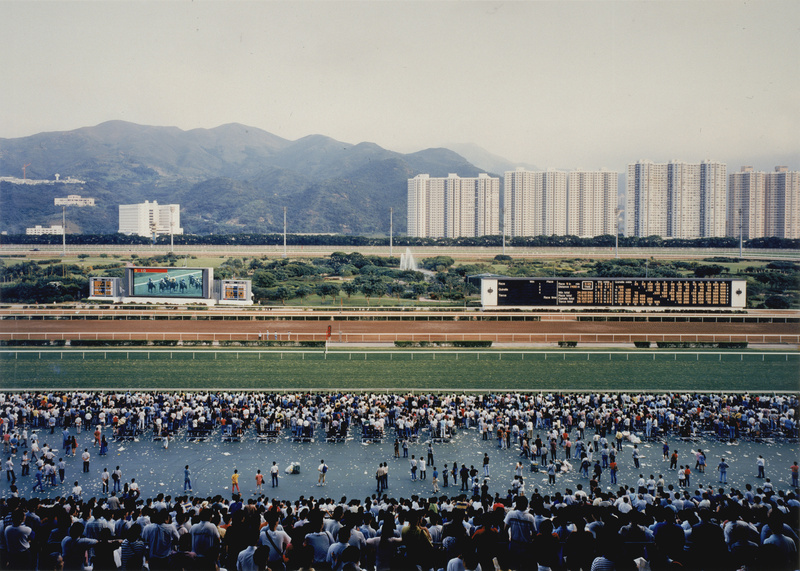 The interface between two programs. python-3.x actually makes second place on the list but I rolled it into Python rather than make a redundant entry. 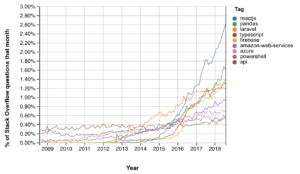 Django and Django Models were eliminated from the list despite being on an upward trend because they have not yet exceeded their previous peak in 2010. 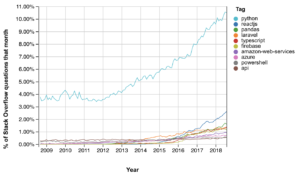 This resurgence, Pandas in fourth place and the presence of tkinter on the list speaks to the general rising of Python. Load all tags on StackOverflow by count descending. Put each of them into StackOverflow Trends and judge by eye if they are currently trending up. Where Do These Technologies Sit in the Overall List? In the whole list of tags by count Python is sixth overall, Firebase (10th place in this list) is 90th, and CMake (50th) is 442nd. id("io.spring.dependency-management") version ("1.0.6.RELEASE") // Pull in dependencies automatically. freeCompilerArgs = listOf("-Xjsr305=strict") // Enable strict null safety. implementation("com.expedia.www:graphql-kotlin:0.0.23") // Generate GraphQL schema directly from code. implementation("com.graphql-java-kickstart:graphiql-spring-boot-starter:5.1") // Get the /graphiql page for free. data-labels="[&quot;White&quot;, &quot;Blue&quot;, &quot;Black&quot;, &quot;Red&quot;, &quot;Green&quot;, &quot;Colorless&quot;]"
Recently we had an issue with very long-lived locks on certain rows in MySQL/MariaDB. Certain people (each row representing a person) would get locked out of updates for hours at a time. Using Flask/uWSGI/MariaDB/mysqldb. SHOW ENGINE INNODB didn’t report any recent deadlocks or other issues but SHOW PROCESSLIST showed some very long sleeping processes and when these were killed the locks would go away. SELECT trx_started, trx_mysql_thread_id FROM information_schema.innodb_trx t JOIN information_schema.processlist p ON t.trx_mysql_thread_id = p.id; was also interesting showing some unclosed transactiosn that corresponded. We seem to have cleared the problem up by explicitly closing the database connection on teardown_request.